Pictured are (left to right): Dorris Smith, Peggy Tremper, Janet Roberts, James E. Van Peursem, Don Hacker, John Stephens, ? Creech, Eleanor McConnell (hidden), Margeret Hamilton (hidden), Barbara Hatfield, Betty Griffin (front), Betty Jennings, Eunice Owqens, Jack Raymond, Jean Knox (front) Carolyn Stamper (behind), Thelma Trosper, Ken Massey. 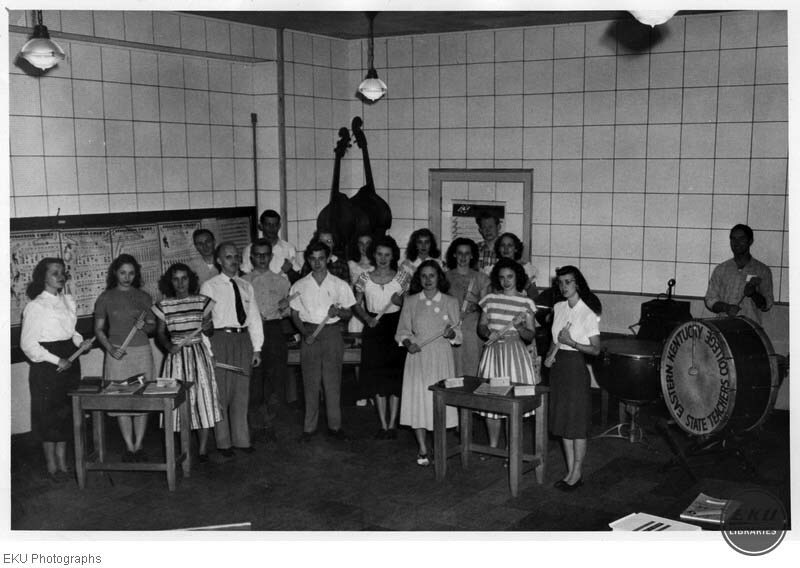 Unknown, “James Van Peursem's Music Class,” Digital Collections, accessed April 26, 2019, https://digitalcollections.eku.edu/items/show/30809.